I hope to never take for granted the beauty around me and the natural settings, beaches, coves, lagoons, forests and shorelines that make Vashon Island special, but should I falter a time or two, all I have to do is take a look at this wonderful video, shot by fellow islander Mike Verharen on a wonderfully (and unusually) clear December day. Tom’s eye view of Point Robinson Lighthouse looking south Sound toward Mount Rainier. Hi, Tom. I, too, was awestruck with the beauty that Mike managed to capture of so many of my favorite spots on the island. In my work as a naturalist and with our local Audubon society, I would love to use this video as a stunning showcase of the amazing natural areas we have to offer… but, I hesitate to do so. Speaking of local rules and regulations, it was hard for me to overlook the scenes showing a dog running on the beach at Fern Cove and along the trails on Fisher Pond. I know I’m preaching to the choir here when I say that Vashon loves its dogs and it shows in the fact that there are actually only THREE places that I know of on the entire island where dogs are prohibited. Two of those locations just happen to be Fern Cove and Fisher Pond (Christensen Pond is the third). Fern Cove is a unique and sensitive estuary habitat that hosts many shorebird species, and when Bill Fisher gifted his pond to the Land Trust he specifically requested that it be a dog-free zone so that folks could better enjoy the shyer creatures of our forests. I hope you don’t mind my posting this info here, Tom. The signage at both these locations is probably not adequate and a lot of folks honestly don’t know that our furry friends are best left at home when visiting these spots. Hi Harsi, thank you for your comment, you are absolutely right. I was wondering when I saw the footage about the dogs along those beaches and trails. As you know I’m a big dog lover, but I do feel strongly that if no dogs are allowed, one should honor that request or rule. Easy for me to say as I have English Bulldogs, who prefer walks to the car and then to be driven. 😉 We want to keep our natural places natural, so I hope your thoughtful comment opens some eyes to the issue at hand, or paw as the case may be. PS–I Loved the last Audubon lecture presented by Ed Swan. 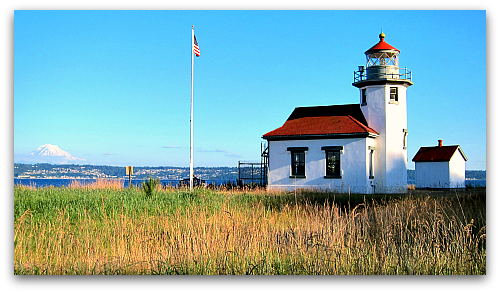 The video makes me want to visit Vashon Island!!! Yep it’s pretty magical, isn’t it. I agree with Laurie… this video makes me want to visit Vashon Island. Just beautiful! Thank you for sharing this beautiful film. It makes me want to visit Vashon Island! I was also struck by the vast amount of drift wood – so sculptural and unique. I’m happy to learn it won’t be carted away. It seems to be part of the spirit of those misty beaches. You can count on me to be on that visit that so many others want to make. Breathtaking does not describe the beauty you are surrounded by. No wonder you are who you are. Thankyou for sharing!!! Your video made me cry for the beauty you live in. Awesome Creator! You’ve certainly found a neck-of-the-woods to call home that is breath-taking. Thank you Kate, I sure love my little island and glad I could share some of its magic with you.